I have extreme big pores and they are always clogged no matter how frequent I went for facial treatment. Namely, I have strawberry kind of nose and face. When ever I went for a skin test, the dermatologist will keep on reminding me that my pores are exhausted, they need more water. In the previous time, I thought I have such oily skin type as my T-zone areas always appear to be oily and so I used all the anti-oily products.Yet, they proved me wrong, I actually have dry and sensitive skin. After all, Skin hydration is always a concern for me. 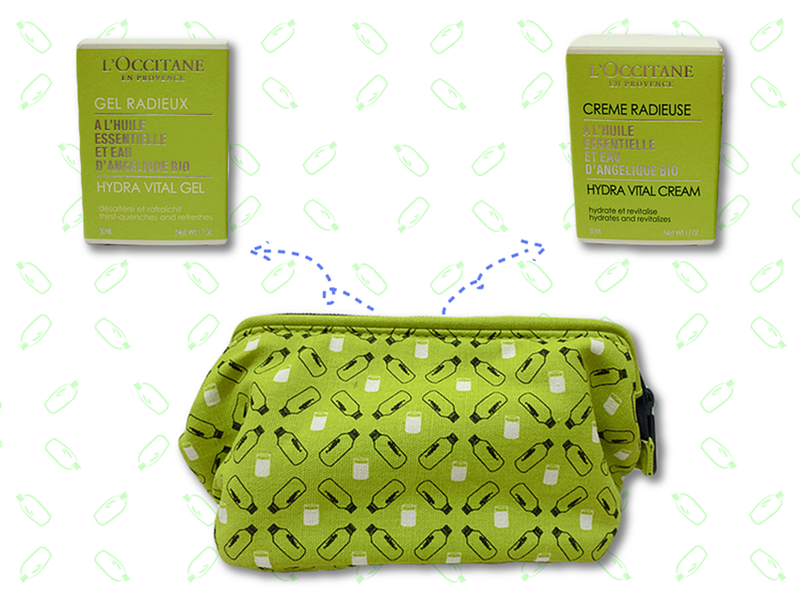 Recently, I have been using L'OCCITANE Angelica Hydra Vital Cream and Gel. Both of them arrived my door step in a tiny bag, looking absolutely cute in fresh green color - The Nature Color. Inspired by nature, L'OCCITANE has introduced three additions to its iconic Angelica range, specially formulated for Asian skins. Angelica range delivers the most effective moisturizing power, instantly quenches skin's thirst and provides long-lasting hydration. 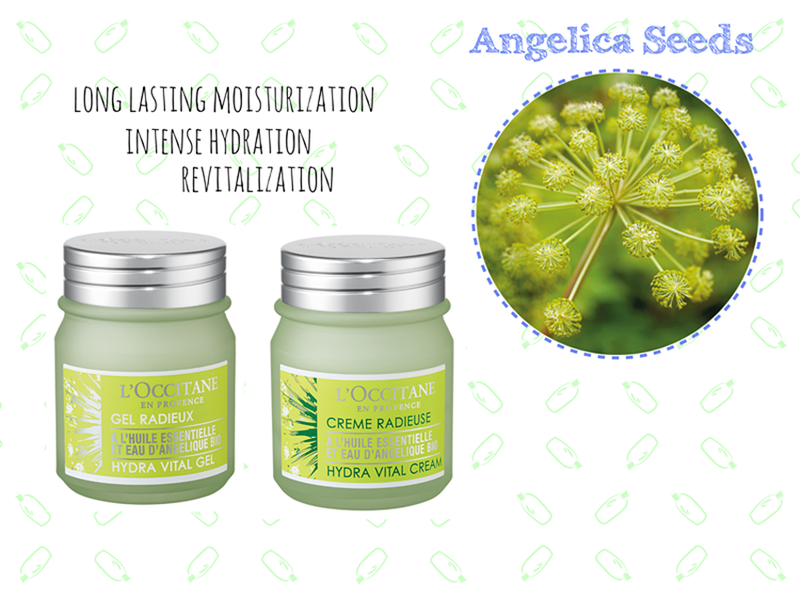 Besides Organic Angelica Water and Organic Angelica Essential Oil which introduced in 2012, the expert has finally discovered the moisturizing power of Angelica seeds. Followed by the reveal of Hydra Vital Cream and Hydra Vital Gel right in earlier of August 2014! The organic Angelica from Dome region, its seeds extract stimulates the production of versican, which is a molecule that promotes delivery of moisture and retention in skin when hydration level falls.Versican regulates and ensures long-lasting, balanced level of skin hydration. 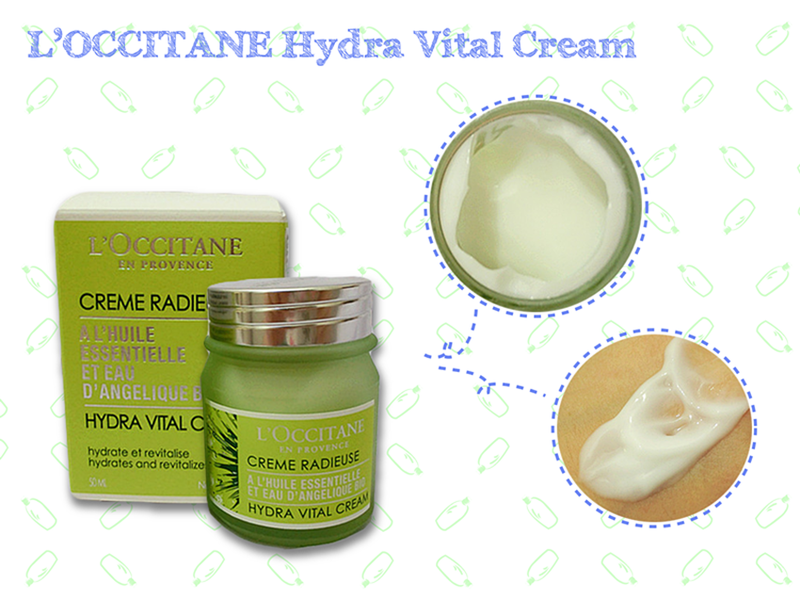 Hydra Vital Cream claims to offer long-lasting moisturization right up to 48 hours. While revitalize and helping skin stay away from environmental stresses, it boosts natural skin hydration and restores comfort. It leaves our skin with a plumper, smoother, radiant and glowy look. It comes in milky-white creamy texture which is slight thick yet sort of watery. It comes in slight sweet floral scent, which is totally exhilarating and delightful. I used it as a day cream as our skin tend to expose to the sun or staying in air-conditioning room and our skin appears to be more dehydrated. 48 hours of moisturization is definitely a must! I found out that this cream appear to be slightly oily compare to the gel form. Yet, I am still used to it as it performs to be in a 'acceptable oily' level. After using it, I found out that my skin appear to be fuller, supple and glowing in health. 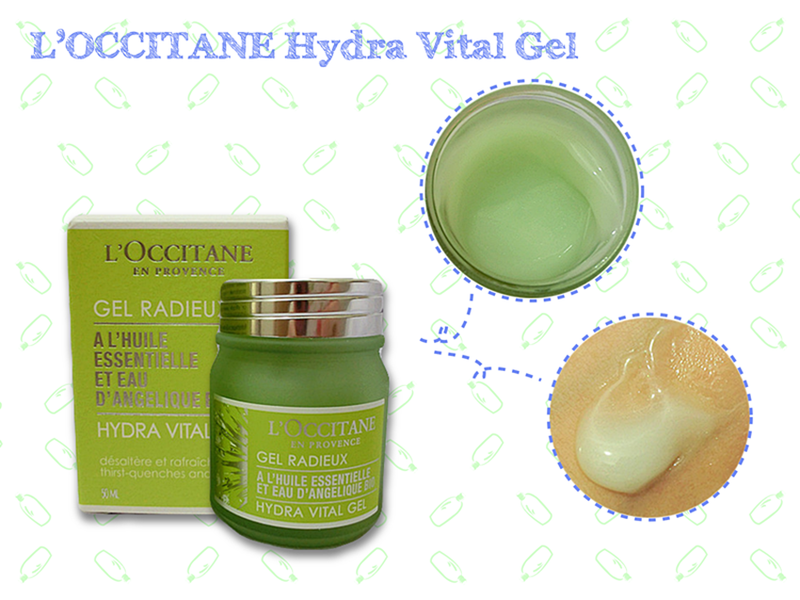 Hydra Vital Gel is a cooling gel which provides 24 hours hydration, giving our skin instant and intense hydration. Soothes and revitalizes the skin at the same time. The aqueous gel immediately melts into the skin smoothly, giving an thirst-quenching effect, restore radiance and vitality from dawn to dusk. It's in gel form in light apple green color and watery texture. It comes with a pleasant scent which smell much like a kind of floral, which is refreshing and relaxing. This is definitely my favorite! It's not oily and even after a long hours, my skin still appear to glow in healthy instead of extreme-glow. It promotes quick absorption as I only massage my face for 1-2 minutes and then it's fully absorb by my skin, leaving my skin in smooth and hydrated condition. I used to apply it as night cream as after the whole day, it's time to give your skin some water and I guess it will perform better when you are sleeping. The scent is brilliant as it tends to clam me down as well. 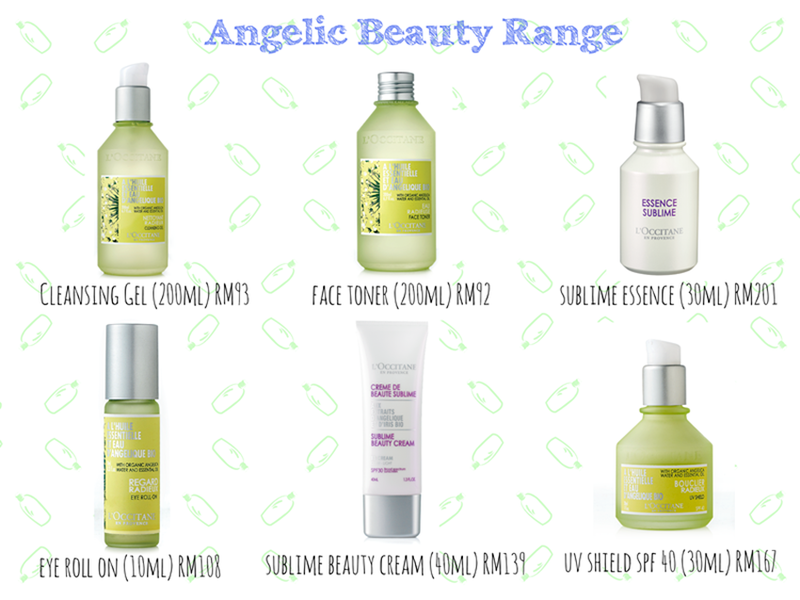 Besides, Hydra Vital Cream and Gel, there are still other bestsellers in Angelica range which is well-recommended to achieve angelic beauty. All the Angelica range are available in all L'OCCITANE outlets. For more information and product details, feel free to visit www.loccitane.com.my or L'OCCITANE FB Page. Thanks L'OCCITANE and TheButterflyProject for the great review opportunity.